The U.S. government has ordered a prototype contact lens that will help military members see virtual information directly on a pair of glasses while still viewing their surroundings. The contacts could improve HUDs, or heads-up displays, currently in use that show troop information, enemy locations, target ranges and more. According to the BBC, the Pentagon has asked for the working prototype from Innovega, the company that has created the lens. iOptik, as the product is called, was partially funded through the U.S. Department of Defense. Unlike the current HUDs that are worn by troops, the iOptik allows for a wide field of vision; up to 120 degrees, per the product’s webpage. The iOptik solves a key problem because the human eye can only focus on one distance at a given time. So when looking at a HUD, for example, a soldier can only see the data it transmits and not the environment around them. The special filter on the iOptik lens allows for dual focus: Seeing real objects far away while also viewing augmented reality data close to the eye. I suspect Google’s(s goog) Project Glass, a similar solution, won’t have this same ability. Here’s a video explanation of how the product works. The iOptik won’t solely be for military purposes. 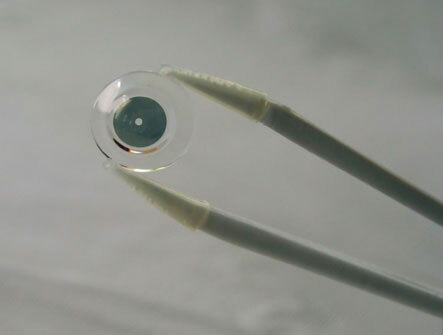 Innovega says the lenses are currently undergoing trials with the FDA here in the U.S. and could be available to the general public by 2014. In as little as two years then, you might be walking up to someone and see their Facebook profile before you even talk to them. To get an even better view of what it looks like being able to see both near and far using the iOptik lens, here’s a demonstration that uses a digital camera to simulate the human eye. The military is usually a couple of steps ahead with this kind of stuff – they’ve been using HUD display helmets and the like for years. Aside from the inconvenience of wearing contacts, this sounds pretty good. Get with the times Gautamoline. Millions of people put contacts in their eyes daily to see the entire world better. 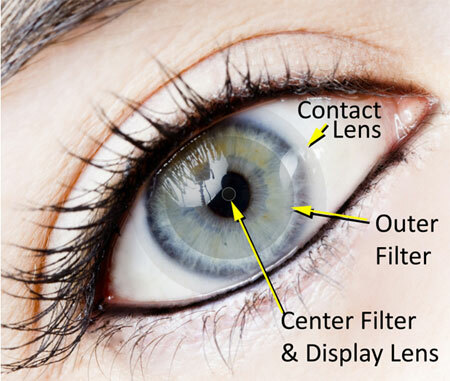 Why not contacts for more specific purposes? Thanks for the advice Kai. You are still welcome to put things in your eyes. Put something in my eyes to view AR content. No thank you, sir! The glasses are fine, but coupling them with contact lenses is very very inconvenient and impractical. AR is the future, but not this way.